PARRIS ISLAND, S.C., May 14, 2011 — With his retire­ment near­ly at hand, Defense Sec­re­tary Robert M. Gates is tak­ing time to vis­it entry-lev­el train­ing facil­i­ties for mil­i­tary ser­vices all over the coun­try. 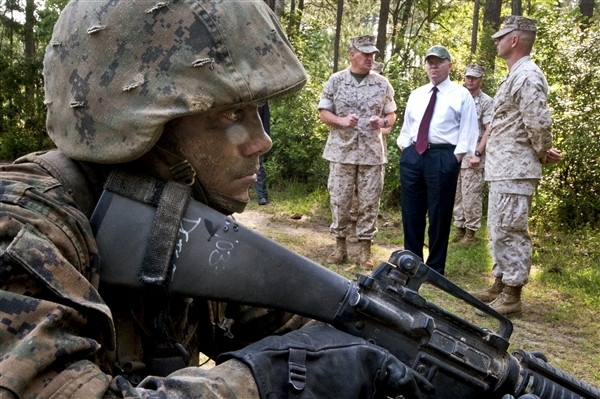 A U.S. Marine recruit awaits instruc­tion while Defense Sec­re­tary Robert M. Gates observes the Cru­cible at Par­ris Island, S.C., May 13, 2011. The Cru­cible is the final test in recruit train­ing, and rep­re­sents the cul­mi­na­tion of the skills and knowl­edge a Marine should pos­sess. Amid the palms, pines and pal­met­tos here, Page Field was in con­stant motion. The noise also was con­stant. Speak­ers in the trees blast­ed out the sounds of bat­tle chaos — the relent­less beat of heli­copter rotors and every pos­si­ble kind of explo­sion. Drill instruc­tors led groups of sweat­ing and exhaust­ed recruits, who clutched rifles as they ran, crawled face up and face down, climbed walls, scoot­ed on their backs through barbed wire and ran on logs to cross a creek. This was day two of what Marines call the Marine Corps Cru­cible, a 54-hour rite of pas­sage at the end of 11 weeks of train­ing dur­ing which recruits become Marines. Only after recruits suc­cess­ful­ly come through the Cru­cible do they receive the eagle, globe and anchor. Only then are they called Marines. “The Cru­cible is very impres­sive,” Gates said, “in the way it brings all the skills togeth­er in terms of team­work, teach­ing about not leav­ing a Marine behind, teach­ing the com­bi­na­tion of skills and core val­ues, and [giv­ing recruits] the oppor­tu­ni­ty to inte­grate every­thing they’ve learned in the pre­ced­ing weeks of train­ing.” Over 54 hours the recruits walk 48 miles car­ry­ing 45 pounds of gear plus the M-16 A2 ser­vice rifle. With lim­it­ed food and sleep, they per­form day and night march­es, night infil­tra­tion move­ment, com­bat resup­ply and casu­al­ty evac­u­a­tion, com­bat field fir­ing as a team, solv­ing prob­lems and nego­ti­at­ing obsta­cles as a team, lead­er­ship tests and core val­ues train­ing. Such val­ues include uphold­ing hon­or, courage and com­mit­ment in every sit­u­a­tion. Marine Capt. Miguel Whyte is a pla­toon leader in the Field Train­ing Com­pa­ny. He and anoth­er pla­toon leader are respon­si­ble for train­ing recruits on the rap­pel tow­er, the gas cham­ber, basic war­rior train­ing and more, and con­duct­ing the Cru­cible. “The event I like the most is called the lead­er­ship reac­tion course,” he said. “I call that the Mac­Gyver course. It’s a true test of their think­ing abil­i­ties.” Mac­Gyver was an action-adven­ture tele­vi­sion show in the mid-1980s in which a resource­ful agent solved com­plex prob­lems with every­day mate­ri­als. Dur­ing the three-hour course, the teams per­form six tasks that test their abil­i­ty to work togeth­er to solve prob­lems. These tasks include using three wood­en boards to cross sev­er­al stumps with­out touch­ing the ground, using the same con­cept to cross a water hole, and haul­ing a large con­tain­er over a wall using avail­able resources. The day before the secretary’s vis­it to Par­ris Island, he spoke with more than 1,000 Marines dur­ing a town hall at Marine Corps Base Camp Leje­une in North Car­oli­na. “Amer­i­ca has leaned heav­i­ly on the Marine Corps this past decade and will con­tin­ue to do so going for­ward because Marines are always ready, no mat­ter what the mis­sion,” Gates said. “In just the past few months,” the sec­re­tary added, “Marines from the II Marine Expe­di­tionary Force have respond­ed to Japan’s dev­as­tat­ing earth­quake and nuclear cri­sis, evac­u­at­ed civil­ians flee­ing upheaval in Tunisia and Libya, con­duct­ed mul­ti­ple air strikes against Libyan tanks and armored vehi­cles advanc­ing on Beng­hazi, and in Afghanistan have giv­en the Tal­iban a severe beat­ing and pushed them out of their tra­di­tion­al strong­holds in Hel­mand after some of the heav­i­est fight­ing of the war.” He called the Marine Corps “an expe­di­tionary force with a mar­itime soul” and said its future is bright.